Ralph’s military records have not been found so it is not clear when or where he enlisted, but he was previously a Private in the Denbigh Yeomanry (regimental number 1422). Ralph was badly injured in the Battle of the Ancre 13–18 November, which was the final large British attack of the battle of the Somme in 1916, before winter. The war diaries of the 10th Battalion Royal Welsh Fusiliers have been obtained by Ralph’s great nephew David Jones from the Royal Welsh Fusiliers Regimental Museum at Caernarfon. Ralph’s case was not deemed terminal and he was transported to Bethnal Green Military Hospital in London. However he died in the hospital on 16 November. Bethnal Green Military Hospital, East London. The story within the family is that Ralph’s body was returned to Hope for burial his brother was sceptical that it was Ralph’s body in the coffin and demanded it be opened so he could check. It was the body of Ralph but in a very poor condition, with limbs missing. It has since been surmised by Ralph’s great nephew David Jones,that Ralph died either through blood loss or the onset of sepsis following surgery. It is possible that Ralph had undergone surgery to amputate limbs that were infected and possibly gangrenous from the gunshot wounds. Cardiac failure can be a consequence of sepsis. It would appear that nothing was done with regards to the War Gratuity because the letter was never returned. The story handed down the family states that Alexander was due for enlistment, his brother (Sgt Cyril Henshaw as he was) instructed him in how to beat the Medical Board, which as far is known he did. John Henshaw, aged 74, a visitor living on his own means. Ralph’s mother had died in 1906. In 1911 his sister Amy was living in Liverpool with her husband Thomas F Deed and two daughters. Ralph’s father Thomas died in 1913, The family still lived in Pentre Farm during WW1. 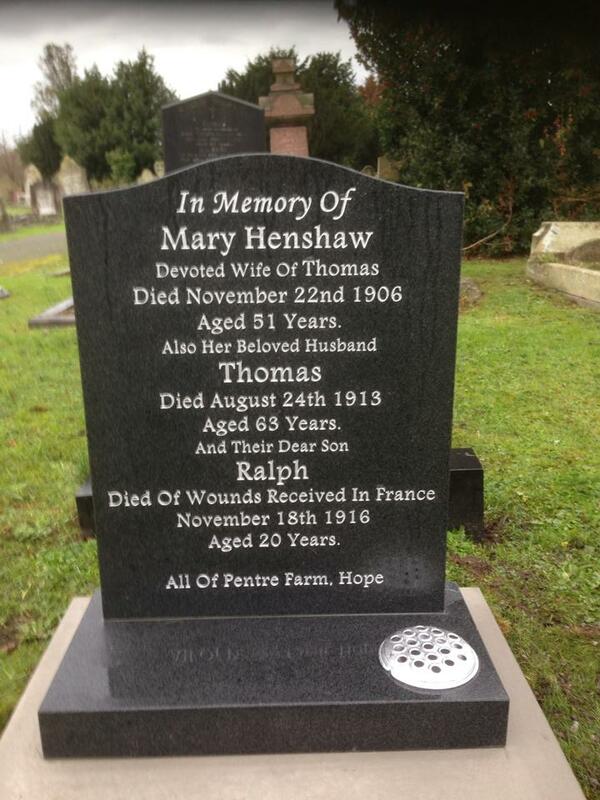 Henshaw family grave with new headstone.